The former pharma CEO's attitude towards public relations needs to be seen to be believed. Big pharma gets a lot of stick. Regardless of cold commercial reality, it’s hard to look a cancer sufferer in the face and explain why you need to charge £200 for a pill that costs 20p to manufacture. Yet the industry spends a lot of time and money on its image, trying to convince people to focus on the good it does rather than the profits it makes. Then along comes Martin Shkreli. It was like manna from heaven to the industry’s critics: a drug company boss (and ex-hedge fund manager – could it be more perfect?) who had no qualms justifying a 5,500% price hike for a medicine used on AIDS and cancer patients because ‘well, we need to make a profit’. His baffled, smirking defence of naked capitalism has tainted the whole industry by association. Big pharma was no doubt relieved when Shkreli resigned from his company Turing, after being arrested over charges of fraud at two previous companies. But Shkreli just hasn’t gone away. His bizarre antics on social media, which have included a Twitter spat with singer Ellie Goulding and a rap ‘diss’ video against a member of the Wu Tang Clan (take a look at the bottom of the article), have kept him very much in the news. And now this. Shkreli was subpoenaed to appear before a US Congressional committee, turned up, invoked his Fifth Amendment right not to incriminate himself and then... well, see for yourselves. Shkreli’s reputation is clearly a lost cause. Who would work with him now? It’s possible he doesn’t realise that or, much more likely, he’s incapable or unwilling to pretend he’s contrite. And why would he be? He’s not contrite, because he believes what he did at Turing was right. It comes back to the uncomfortable truth that pharma’s more polished executives are so keen to dress up (even if they won’t actually deny it) – high prices and big margins are necessary to pay for the huge risks the industry takes to develop new drugs. If the drug industry isn’t profitable, it ceases to produce the drugs that will save more lives in the future. Price gouging is clearly at the sharp end of that, placing the burden disproportionately on a small group of very vulnerable people, but it’s the same principle. The whole Turing mess has clearly caused big pharma a lot of grief. It doesn’t want Shkreli as its unofficial spokesman. But of the other hand this does present an opportunity for the industry to distance itself from the practices that have caused so much upset. Let the public associate gouging with Shkreli and hate him for it, while big pharma proves it can be socially responsible and still make a profit. Who knows - as a scapegoat, he might end up doing them a favour. 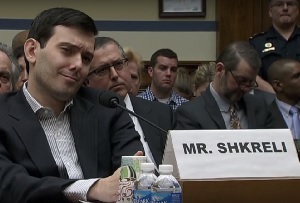 As for Shkreli, if all else fails he could at least turn to a career in hip-hop. Here's his video, as promised (warning: it contains the odd expletive).